Join us as we show you around our riad in the heart of the Marrakech medina, the old city full of labyrinthine stone alleyways and tunnels, souks and marketplaces bustling with people, and all manner of glittering goods hung and piled high. I found Dar Kalam on Airbnb*, and after reading reviews, decided it would (hopefully) be the perfect place to unwind after the three plus days it took us to get here from Oregon. Part of our strategy for overcoming jet lag is to get ourselves into a place where we can both rest and relax as well as explore a little, but not hit the ground running too hard. I will spend a bit more money than I normally do on such a place, knowing that we will appreciate more comfort and space than we may require further in our travels. The friendly owner of Dar Kalam arranged for a taxi to pick us up at the airport. It's always fun to scan the crowd of waiting drivers and find that one sign with your name of the name of your hotel, and it's only an experience I've had a couple of times. The drive to the gate of the Old City was just about 10 or 15 minutes, and from there our driver engaged a man with a pushcart to walk us the rest of the way to our riad. A riad is a traditional Moroccan home of clay or mud brick, usually at least two stories, built around a central, interior courtyard. It was built both to give the family privacy as well as shelter from the weather. Many of the riads here have been bought and restored by foreign investors and turned into hotels and guest houses. You would never know from the outside what you are looking at, as often all you see are the walls and a door, often ornate, sometimes plain, at ground level. This picture is taken from our doorway and shows the "tunnel" you turn into from the little street to find our home. And here is our doorway, fairly simple as doorways here go, but classy! 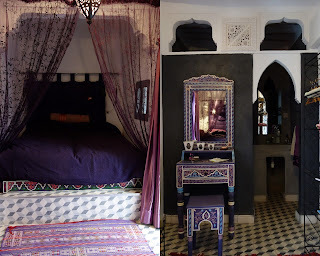 Part of the reason I chose this particular riad over others I looked at, is that the price included the services of Nadia, who helps look after the home, makes breakfast each day, and will cook other meals as wanted for only the cost of food. We had requested that she have lunch for us open our arrival. After greeting us with her beautiful French bonjour, she showed us around the house and led us to the rooftop where she had a lovely tagine lunch ready for us. The kids were thrilled to discover the big basket of fresh, crusty bread. Nadia speaks French and Arabic and hardly a word of English! We've managed to communicate just fine with help from various translation apps, which both she and Erik have on their phones. It's amazing how technology has changed the world. The rooftop is a beautiful place to relax. Even though we're just a couple minutes walk from all the hustle and bustle and noise of the souk and the Jeema el Fna, the main square, it is truly quiet and still here. There is the cooing of doves and the sweet melodies of the birds of North Africa to keep a person company up here, and it is enough. A delicious lemon and olive chicken tagine Nadia made us for dinner the other night. We have enjoyed trying some different foods as we've been out and about, but it's quite nice to come home to a hot dinner. This is part of the third floor from above. What you can see in this photo is the "plunge pool", which is not filled at this time of year, although with temperatures over 70 degrees I have no doubt my children would have been happily plunging. In the lower left is the "solarium". which is like a giant skylight that is open down to the ground floor. The panels can be opened or closed. It lets in a lovely amount of light, and little birds find their way in through the gaps and flitter about the railings inside! They seem to know their way out agin, as they've all come and gone without a fuss. The home has no external windows, but the bedrooms on the middle floor have curtained windows that open onto this central area, and it feels a lot more open than I first thought. I was afraid I might feel a bit claustrophobic, but I haven't at all. This is the upstairs, open air covered seating area where we ate our lunch the first day. It's a beautiful and comfortable space for hanging out. Next to it is a small kitchen with a sink, two burner gas stove, and wonder of wonders, and washing machine! I've taken advantage of that and done a couple loads of laundry. I imagine that a lot of the life in a traditional riad takes place on this upstairs courtyard. Over the covered seating area, there is one final "upper deck." It is here that I've been hanging my laundry to dry, and in this picture the children are working on their journals. This is on the ground floor, a cozy seating nook. There is no central heating in the riad, but we were provided with one of those big kerosene heaters that are used in outdoor patio seating at home. Probably not super safe for indoors, but since it's all kind of open air, we're not too bothered. We've turned it on to take the chill off in the morning and evenings, and it feels so nice. We've sat down here in the evening after dinner and read aloud as a family. Raphi was really looking forward to the mint tea here, especially after hearing it is liberally sweetened with sugar. He's getting quite good at pouring it up high like the Moroccans do! On the second floor (first floor?) there are two bedrooms, plus a bathroom and toilet room. The bathroom here has a washbasin and a shower, not a toilet, which makes sense. And two of the bedrooms have an ensuite bathroom, but none of them have a toilet! There are lovely things everywhere! This is the master bedroom, but as it is quite obviously a Purple Princess room, we let our princesses have it instead. Every little girl wants a vanity, right? The view from the upper rooftop, the minaret of the nearby mosque aglow at dusk. We hear the muezzin call the faithful to prayer five times a day. I add my own prayer, for the precious people of this land. I'm so thankful for this time we get to spend here. *If you've never used airbnb before, this link will give us both a $35 credit. Looks so amazing! Love following your journey! What a beautiful place! Every trip you take I think "this is the best one yet" Happy travels to you all!